Award-winning helicopter operator, Maverick Helicopters, has partnered with leading off-road adventure company, Pink Jeep Tours, to offer a one-of-a-kind Grand Canyon sightseeing and aerial experience. Above, Below & Beyond Tour features highly-trained adventure guides and breathtaking views of the Grand Canyon West Rim from 3,500 feet below the rim, at the rim itself and aboard Maverick Helicopters’ state-of-the-art aircraft. 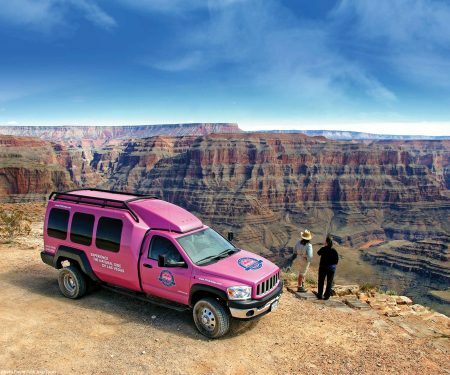 The 10 to 11-hour excursion takes guests to the Grand Canyon West Rim on a personally guided and narrated excursion in Pink Jeep Tour’s iconic four-by-four Tour Trekker. Along the way, adventurers experience unsurpassed views of the Hoover Dam, Lake Mead, Mojave Desert and Joshua Tree Forest. 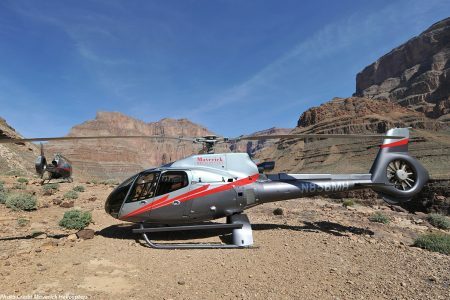 After arriving at the canyon, passengers will board Maverick Helicopters’ luxurious ECO-Star aircraft and descend 3,500 feet to a private landing site on Hualapai Indian Territory, 300 feet above the Colorado River. After the helicopter experience, guests have the opportunity to visit the Native American cultural exhibits of the Hualapai Nation and stop for photos at the Hoover Dam before heading back to Las Vegas. The adventure also includes hotel pick-up and drop-off, a barbecue lunch and unlimited bottled water.